It's been several years since I was sold on using a NAS to solve the data sharing problems at home. QNAP TS-439 Pro was my choice. Frequent firmware updates kept it up to date and relevant. When something becomes popular, say Google Drive, you get a firmware update that integrates it to NAS. One firmware for all versions of QNAP, new and old. So, your old hardware does not become irrelevant in a year or two. Traditionally AFP (Apple Filing Protocol) was the protocol preferred on Macs for network access. Of course, Windows used SMB (Server Message Block) protocol of Microsoft. Currently Windows 8.1 uses SMB v3. With Maverick (v10.9) release, Apple backed away from their own AFP protocol in support of SMB v2, and that was a problematic release to say the least. With 10.10 Yosemite Mac OS X supports v3 as the default sharing protocol. I could workaround the problem by going to terminal and use 'scp' to transfer files to NAS, but it was not that convenient. Many people complained about this problem on Apple forums. None of the solutions offered helped in my case, so I went back to AFP, and that problem disappeared. I still see other issues when, for example, editing a word document: Word somehow cannot save the file the first time, then lock is released and file is saved. That's more of an Microsoft office problem, rather than AFP/SMB though. One problem that annoyed me was that even with AFP, I had to connect to my NAS over and over. It was not as bad as SMB which kept on prompting me, but it was still an hassle, especially on my Macbook, which is not always near my wifi to connect to home NAS. Over the weekend, I took another look at Apple's Autofs: Automatically Mounting Network Files Shares whitepaper and implemented it for my macs. The implementation is simple. Apple now has /etc/auto_master file, which can lookup other files for indirect mounting information and automatically carry out the mount instructions. then I created the auto_qnap file and changed its permissions to be read/writeable by root only, as it might need to contain password to connect to certain network shares. Using this setup, I could now tell Flickr Uploader Mac Client to watch ~/Pictures/PicsOnNAS folder, and automatically upload pictures when I add a new ones there. There you have it. It's not as easy as it is for Windows which automatically detects connection state of the mapped network drives, but close enough. Enjoy! Yahoo offered Automatic Camera Upload feature from phones, which is pretty much what everyone else was offering and it had a couple of hick ups especially when new iPhones with newer iOS arrived, but other than that it pretty much worked OK. This setup worked fine 'going forward' but until now there was not a good way of uploading pictures. 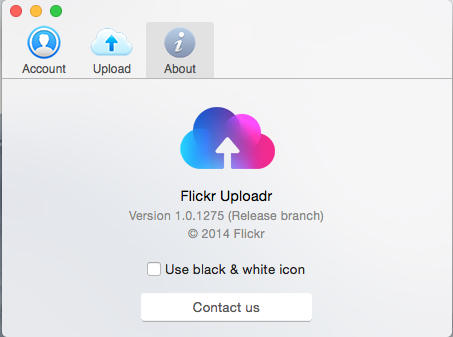 A few weeks ago, Yahoo released Flickr Uploadr for Mac (beta) and I found out that it works perfectly for my use case. It can use iPhoto, which I do not really use. But more importantly, it can upload folders of pictures and it creates an Album with the name of the folder. Of course not all my folders were perfectly named like that, sometimes I had to use PowerShell to fix them (may be subject of another blog post). 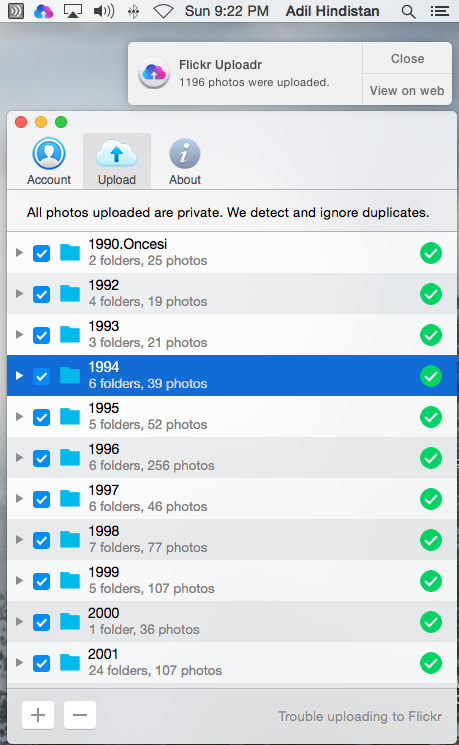 It not only uploads them once, but can upload any new pictures you put in those folders. So, if you have an upload folder, for example, anything you drop in there will be automatically uploaded. It also has de-duplication. Not a very smart one at the moment, so if you have the same picture with a different size, it will not detect that but if you have the same picture in more than one folder, it will detect that and will not upload it again. I also had to deal with (SMB) connection issues I was having from my iMac to my QNAP NAS where I keep gigs and gigs of pics, and came up with a method to Automatically mount the NAS whenever I needed it without bugging me with credentials and stuff (definitely another post). That's all for now! Enjoy, and let me know what you think if you try it.